Citation Information: J Clin Invest. 2016;126(3):1126-1136. https://doi.org/10.1172/JCI84997. The generation of naive T cells is dependent on thymic output, but in adults, the naive T cell pool is primarily maintained by peripheral proliferation. Naive T cells have long been regarded as relatively quiescent cells; however, it was recently shown that IL-8 production is a signatory effector function of naive T cells, at least in newborns. How this functional signature relates to naive T cell dynamics and aging is unknown. Using a cohort of children and adolescents who underwent neonatal thymectomy, we demonstrate that the naive CD4+ T cell compartment in healthy humans is functionally heterogeneous and that this functional diversity is lost after neonatal thymectomy. Thymic tissue regeneration later in life resulted in functional restoration of the naive T cell compartment, implicating the thymus as having functional regenerative capacity. Together, these data shed further light on functional differentiation within the naive T cell compartment and the importance of the thymus in human naive T cell homeostasis and premature aging. In addition, these results affect and alter our current understanding on the identification of truly naive T cells and recent thymic emigrants. Neonatal thymectomy results in lower naive CD4+ T cell percentages and skewing toward a memory phenotype in the first years (1–5 years) of life. (A) Blood lymphocyte count of CD3+, CD4+, and CD8+ T cells in HCs and neonatally Tx children for the age groups of 1 to 5 years. 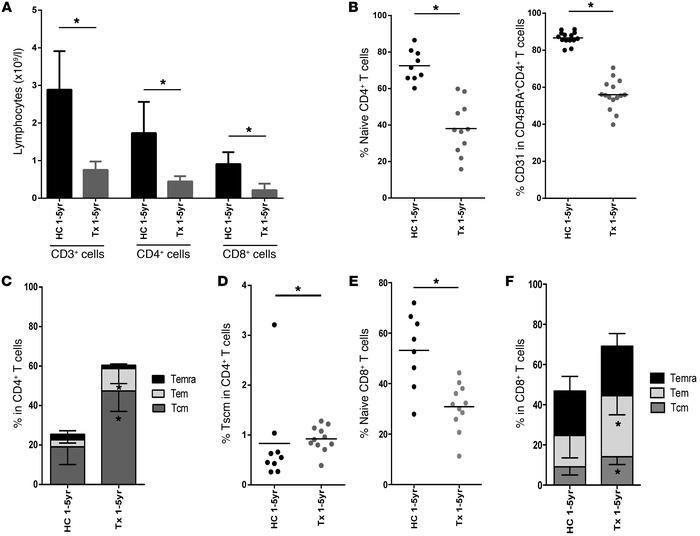 (B) Left panel, percentages of naive T cells (CD45RA+CCR7+) within the CD4+ T cell population. Right panel, percentages of CD31-expressing cells among CD45RA+CD4+ T cells. (C) Percentages of Tcm (CD45RA–CCR7+), Tem (CD45RA–CCR7–), and Temra (CD45RA+CCR7–) in the CD4+ T cell pool. (D) Percentages of Tscm (CD45RA+CCR7+CD28+CD27+FAS+) in the CD4+ T cell pool. (E) Percentages of naive T cells (CD45RA+CCR7+) within the CD8+ T cell population. (F) Percentages of Tcm (CD45RA–CCR7+), Tem (CD45RA–CCR7–), and Temra (CD45RA+CCR7–) in the CD8+ T cell pool. Black circles (or black bar, A), young HCs (n = 8–14); gray circles (gray bar, A), young Tx (n = 10–15). Data are shown as mean ± SD. See also Supplemental Figure 1. *P < 0.05, Mann-Whitney U test.